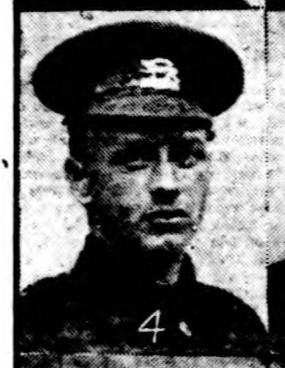 From the Grantham Journal, 25th August, 1917: "Lance-Corporal H.A.Hart, of Bottesford. News reached his parents last week that Lance-Corporal H.A.Hart, Leicester Regiment, had been wounded. He had been at front just over twelve months. He joined the army in March, 1916. Further details of his injuries showthat he was wounded in the left knee, and after an operation was going on quite satisfactorily. Lance-Corpl. Hart has two brothers serving in the army." One of the two brothers was Arthur Hart, R.E.. The other might have been William Frederick Hart, the oldest of the boys, but as yet no record of his military service has been located. The two other brothers, Percy and Sidney, were born in 1903 and 1907, respectively, and are most unlikely to have been in the army in 1917. Harry Hart was one of three brothers who all served in WW1. Arthur James Hart joined the Royal Engineers, and Ewart (Edward) Hart joined the RNVR. Harry Albert Hart was born at Great Ponton, near Grantham, Lincolnshire, in 1892, son of William Hart and Mary Hart nee Jowett. William Hart was born in Arlesey, in 1861, but Mary Jowett was born in Rockley, Nottinghamshire in 1861. They married at East Retford, Nottinghamshire, in June 1882. In the Census of 1891, William was a railway signalman living with his wife and young family at Station Cottages, Great Ponton, Lincolnshire. In the 1901 census, they still lived at Great Ponton, William Hart still a railway signalman. There were now seven children, comprising William Frederick (14, a farm labourer), Arthur James (13, a railway office boy), Harry A. (9), Nellie (7), Lucy (5), Edward (2, later called Ewart) and Alice (1). In 1911, Harry Hart does not appear on the 1911 census for Bottesford. His new address was 209, Main Street, Bulwell, Nottingham, and he was employed as a butcher’s assistant by Mr Walter Chambers, butcher. Apart from him, the Harts lived at 2 Market St, Bottesford. William senior was again a signalman. William junior had become a ‘wholesale clerk’, Arthur a ‘national telephone clerk’, and Lucy a domestic servant. Ewart, Alice and two new twins Eva and Percy were all at school, and there was also the youngest, Sydney, still at home. Harry Hart served in the Leicestershire Regiment. He enlisted on 1st March 1916, as a private, Service Number 25922. He married Dora Alice Jenkinson in the Spring of 1916, at Bingham, when he had 10 days leave. Shortly afterwards, he returned to his regiment and was posted to France. A year later, when serving on the Somme, he was wounded by shrapnel. On the 25th August, 1917, the Grantham Journal confirmed that he had joined up in March 1916 and had been at the front for a year, adding that “at present he has been wounded in his left knee and after an operation he is ‘going on well'”. He was discharged on 31st January, 1918, aged 26. He was awarded the British War Medal and the Victory Medal, and also received the UK Silver Badge, Number 438016. Harry had met Dora Alice Jenkinson, who came from Barkestone le Vale, at the Redmile Feast in 1912, and they married in April 1916. In 1919, following his discharge from the army, he started work on the railways, as a porter and shunter at Corby Glen. Unfortunately, he was seriously injured when his hand was crushed between two wagons, after which he was transferred to Lincoln to work as a crossing keeper, then to Donnington where he stayed for 21 years before moving again to Scarrington. In 1947, Harry and Dora moved back to Bottesford, where he had lived as a child, and they remained in the village for the remainder of their lives. In comments added to the page about Chapel Street posted in 2008, Avis Hand told us: “I … remember visiting Harry and Dora Hart who lived in a tiny cottage in Chapel St. I think Harry worked at the signal box nearby, around the 1950’s.” Our editor’s reply stated: “It is our understanding that a Mr H. Hart lived in one of the two cottages in the 1950’s (Mr Reuben Jackson lived in the other) that was converted into the single dwelling now called Rutland House, No. 16 Chapel Street.” In January 1961, they still lived on Chapel Street, next to Winn’s shop. By this time, Harry had retired from the railway, and was a school crossing patrol at the Cross. He and Dora enjoyed Bowls, whist and going to the Darby and Joan club (probably the Forget-me-not Club) in Bottesford. Harry Hart died on 13th January, 1968, aged 78, his death registered at Melton Mowbray. His wife Dora Alice died on 25th October 1979, aged 83.